We always love to hear from our customers. Especially if they are happy! Sandy emailed us with a problem yesterday and Kevin’s reply enabled him to sort it out. i would like to thank you for your response and for all the detailed instructions you gave me. you helped me a lot as everything is ok and working right now. it was just the screw untighten as i quessed but i was tightening it in the “wrong” place.with your help and instructions i made it right. thank you so much for your precious help. Please, please don’t do this!!! 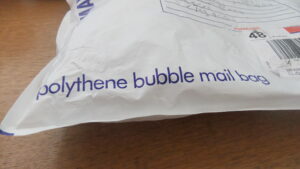 We find it difficult to understand why anyone would send something in the post to us with no packaging at all!! This one came from Saudi Arabia— And there was no paperwork in the box!! Please refer to our website for advice on packing your kit. We have recently received more repair and service work from countries outside the EU than usual. Whilst we obviously welcome all customers, new and old, we have found that guidelines for goods being sent to the EU have changed. From our recent experiences, our advice has to be that : If you send items for repair from outside the EU you will be liable for Customs Duty and VAT on the value of the goods sent. Please ensure you use a service that is proficient in the protocols required to negate these charges, as any costs levied will be your responsibility and cannot be disputed. K.M.R. Photographic Services Ltd T/A Aquaphot cannot be held liable if the paperwork is incorrect or incomplete, or if the carrier makes a mistake. The sender will be liable for any resulting additional costs. Sometimes the carrier does get it wrong – then it seems we are liable to pay import duties and VAT!! We have had a couple of instances recently whereby we have received the work, estimated to the customer, had a go-ahead, completed the work, returned the equipment to the customer…………… then received the bill from the carrier- in one instance these charges being more than double the repair bill!!!! In this case the customer had filled in all forms correctly. We are in dispute with the carrier who made the error. So far the carrier has generously offered to pay 50% of a bill incurred 100% by them! The time taken with phone calls to try and sort this has been ridiculous! 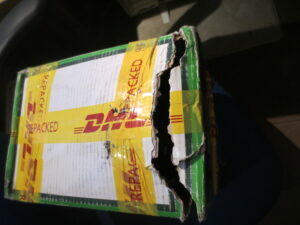 Please take extra care if you still decide to ship your kit to us! “Surfers Against Sewage” have created a 30-ft warship made out of ocean plastic from around the UK’s coastline to illustrate its point. What a week we are having! We have returned repairs to Romania, France and London for onward journey to Australia on Saturday, among others! We have work on the shelf from Saudi Arabia, Spain and America. We have also had enquiries from Dubai and a South African gentleman in the UK. Word sure does get around! Please, please don’t use these to send your kit to us! 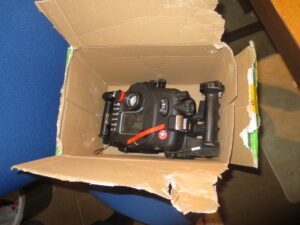 This is NOT adequate packaging for posting your underwater camera kit to us! We have said before and need to say it again, adequate packaging of your valuable underwater photographic equipment is vital! We cannot see that any protection has been afforded to the kit and, sadly, what ever happened in transit resulted in the handle being bent and a crack in the base of the housing. There was also no indication of the sender in the bag. Please refer to our website page for postage advice! Funny, what arrives in our workshop! We often have unexpected extras in boxes with kit that comes in for repair- towels, shopping bags, t.shirts for example. 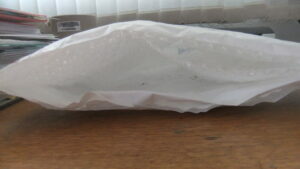 Today we found a teaspoon among the packaging in one parcel!!!! Including a picture from our customer Nick Blake- Congratulations Nick!